intensity autocorrelation: gives the pulse width when a particular pulse shape is assumed. spectral interferometry (SI): a linear technique that can be used when a pre-characterized reference pulse is available. Gives the intensity and phase. The algorithm that extracts the intensity and phase from the SI signal is direct. 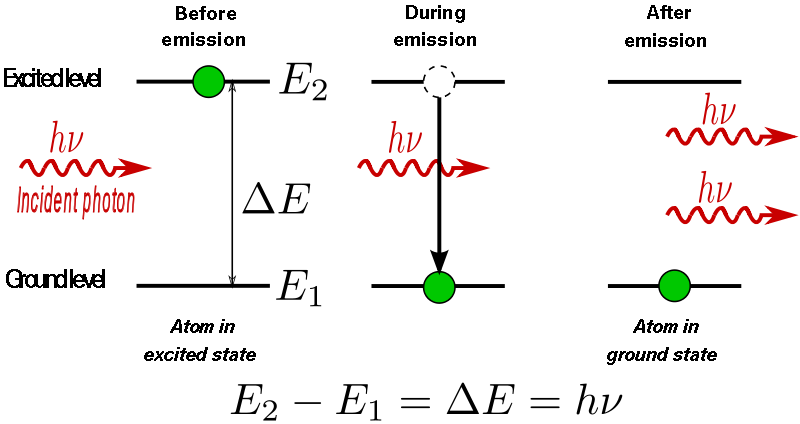 Second harmonic generation (SHG; also called frequency doubling) is a nonlinear optical process, in which photons interacting with a nonlinear material are effectively "combined" to form new photons with twice the energy, and therefore twice the frequency and half the wavelength of the initial photons. It is a special case of sum frequency generation. 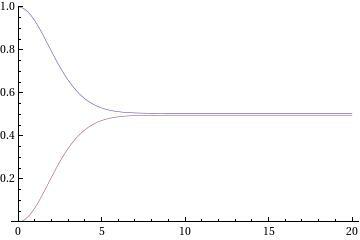 The two-level atom approximation. When the light angular frequency w coincides with one of the optical transitions of the atom, we have a resonant interaction between that transition and the light field. We can therefore neglect the other levels of the atom, which only weakly interact with the light because they are off-resonance. The atom will have many quantum levels, and there will be many possible optical transitions between them. However, in the two-level atom approximation we only consider the specific transition that satisfies eqn E2-E1= hw and ignore all the other levels. Confocal laser scanning microscopy (CLSM or LSCM) is a technique for obtaining high-resolution optical images with depth selectivity. The key feature of confocal microscopy is its ability to acquire in-focus images from selected depths, a process known as optical sectioning. Images are acquired point-by-point and reconstructed with a computer, allowing three-dimensional reconstructions of topologically complex objects. For opaque specimens, this is useful for surface profiling, while for non-opaque specimens, interior structures can be imaged. For interior imaging, the quality of the image is greatly enhanced over simple microscopy because image information from multiple depths in the specimen is not superimposed. 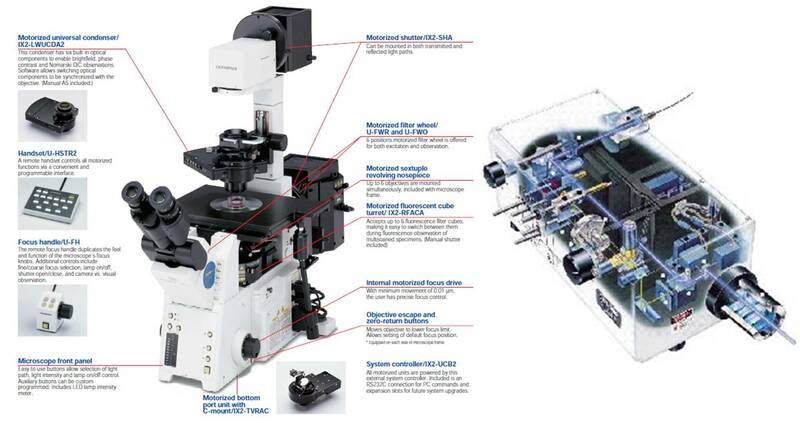 A conventional microscope "sees" as far into the specimen as the light can penetrate, while a confocal microscope only images one depth level at a time. In effect, the CLSM achieves a controlled and highly limited depth of focus. In a confocal laser scanning microscope, a laser beam passes through a light source aperture and then is focused by an objective lens into a small (ideally diffraction limited) focal volume within or on the surface of a specimen. In biological applications especially, the specimen may be fluorescent. Scattered and reflected laser light as well as any fluorescent light from the illuminated spot is then re-collected by the objective lens. A beam splitter separates off some portion of the light into the detection apparatus, which in fluorescence confocal microscopy will also have a filter that selectively passes the fluorescent wavelengths while blocking the original excitation wavelength. After passing a pinhole, the light intensity is detected by a photodetection device (usually a photomultiplier tube (PMT) or avalanche photodiode), transforming the light signal into an electrical one that is recorded by a computer. 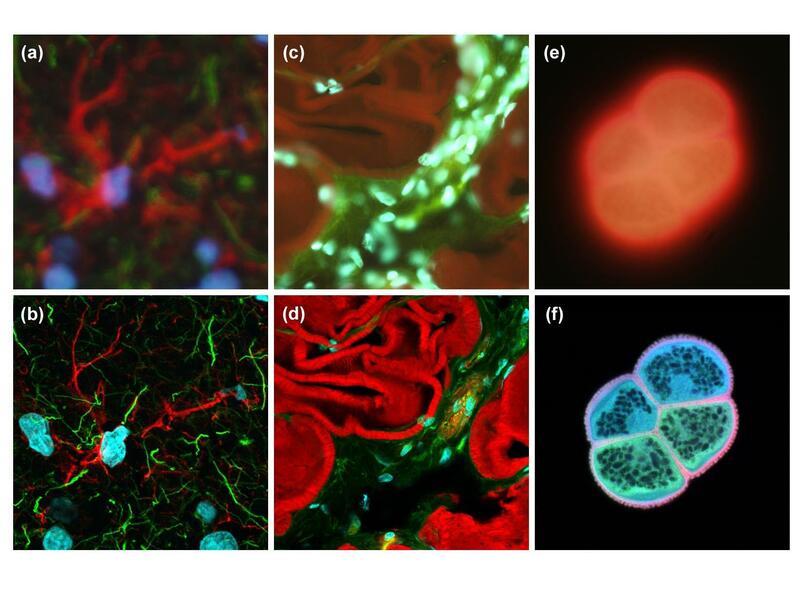 Comparison of widefield (upper row) and laser scanning confocal fluorescence microscopy images (lower row). In Nonlinear optics a z-scan measurement is used to measure the non-linear index n2 Kerr nonlinearity and the non-linear absorption coefficient &delta&alpha via the "open" and "closed" methods respectively. As nonlinear absorption can affect the measurement of the non-linear index the open method is typically used in conjunction with the closed method to correct the calculated value. 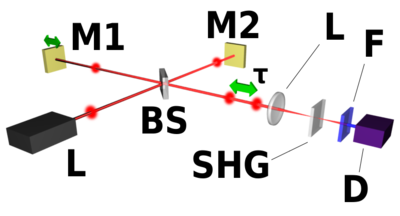 Closed Aperture Z-scan Technique : In this setup an aperture is placed to prevent some of the light from reaching the detector. The equipment is arranged as can be seen in the diagram. 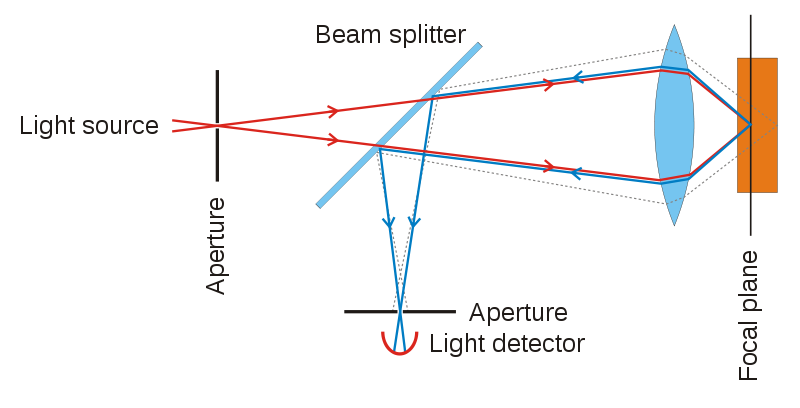 A lens focuses a laser to a certain point, and after this point the beam naturally defocuses. After a further distance an aperture is placed with a detector behind it. The aperture causes only the central region of the cone of light to reach the detector. 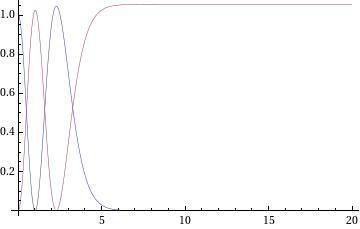 Typically values of the normalised transmittance are between 0.1 < S < 0.5. Open Aperture Z-scan Technique : This method is similar to the above method, however the aperture is removed or enlarged to allow all the light to reach the detector. This in effect sets the normalised transmittance to S = 1. This is used in order to measure the non-linear absorption coefficient &delta&alpha . 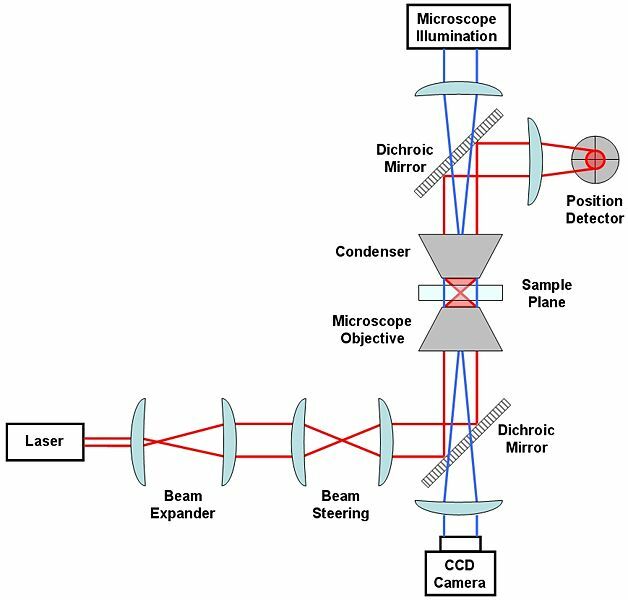 >Optical tweezers (originally called "single-beam gradient force trap") are scientific instruments that use a highly-focused laser beam to provide an attractive or repulsive force (typically on the order of piconewtons), depending on the refractive index mismatch to physically hold and move microscopic dielectric objects. Optical tweezers are capable of manipulating nanometer and micrometer-sized dielectric particles by exerting extremely small forces via a highly focused laser beam. The beam is typically focused by sending it through a microscope objective. The narrowest point of the focused beam, known as the beam waist, contains a very strong electric field gradient. It turns out that dielectric particles are attracted along the gradient to the region of strongest electric field, which is the center of the beam. The laser light also tends to apply a force on particles in the beam along the direction of beam propagation. It is easy to understand why if one considers light to be a group of particles, each impinging on the tiny dielectric particle in its path. This is known as the scattering force and results in the particle being displaced slightly downstream from the exact position of the beam waist.